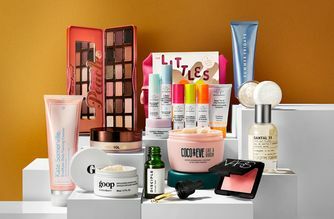 From lifestyle blog to best-loved beauty brand, goop is the green, clean revolution on every natural beauty’s lust list. If you want to drink your way to glowing skin (and who wouldn’t…) look no further than GOOPGLOW! A power shot of skin-supporting ingredients and antioxidants (including vitamins C and E and CoQ10) this daily supplement helps to reduce the free radical effects of the sun, pollution, stress and more, minimising damage to reduce signs of premature ageing, such as dullness, uneven skin tone and loss of firmness. One of the most covetable products in goop’s incredible range, GOOPGLOW lets you drink your way to glowing, youthful skin. A mega-dose of skin-supporting ingredients, this supplement has an orange and lemon verbena taste – and it looks a little like the sunrise when you mix it with water. A power shot of antioxidants designed to reduce the free radical effects of the sun, pollution, stress, and more, the blend features vitamin C, an essential antioxidant; vitamin E, a potent antioxidant and free radical scavenger; CoQ10, which helps to support cellular energy production and defend cells; grapeseed, a powerful antioxidant that boosts collagen and further guards against free radicals and, finally, lutein and zeaxanthin, which help to protect skin and eyes from environmental harm. The single-dose packets are effortlessly easy to use, so you can get the dreamy goop glow just about anywhere. goopglow is conveniently packaged in single-dose stick packs, designed to be mixed with 8 fl oz. of water and taken daily. Drink as part of a healthy morning-skin ritual. Want to know how Gwyneth gets her gorgeous glow? I got these as a free gift in a cult beauty goodie bag and instantly fell in love. I definitely saw a difference in my skin and generally felt really good after even just one of these.... I’ve since bought another pack of 5 but they just go so quick and for the price I can’t justify it - sad times. I really noticed a difference in complexion and general well being! But having gone through two boxes I think that it is too expensive to justify a monthly purchase. If I had a special occasion or trip approaching I may purchase again to be all glowing for that. If your budget allows- it’s well worth it! This is completely overrated Goop junk. No surprises there... It came as part of a Cult Beauty offer and I was willing to give it a go, but the powder doesn't dissolve fully and leaves a horrible stain around the glass. After 5 days, I didn't notice a thing, and my skin is generally pretty good. No 'glow'. Actually quite angry that this kind of thing is being heralded as some kind of miracle glow. It's just ludicrously expensive Berocca! This is yummy and works wonders for brightening your complexion. The only negative thing is that it is very expensive. After all the wonderfull reviews I've read I thought I'd fall in love with this but it didn't happen. It tastes citrusy which is good (I love the citrus flavour) but in a "Gatorade way" which I dislike - that's only my personal taste. Also to achieve an even texture drink you need to stir a lot. Haven't noticed any improvement in my skin, but maybe 5 sachets are not enough. I would buy the bigger box if it didn't cost that much. I like to think of this as a luxe version of effervescent vitamin C tablets, with the added skin bonus of antioxidants. The refreshing orange taste is great and (to my surprise!) someone commented that I was 'glowing' after a few days of drinking these. Get these if you want to feel fresh and virtuous in the morning. L'ho acquistato dopo aver letto la lista degli ingredienti: si tratta di sostanze antiossidanti che aiutano il recupero dell'organismo in generale e quindi non hanno solo un'azione a livello di derma. Lo sto prendendo da qualche settimana e devo dire che la mia pelle è già più luminosa. Però potrò dare un giudizio più completo in un periodo di tempo più lungo. Ho comprato due scatole e vedremo i risultati a lungo termine. **** I bought it after reading the list of ingredients: it is antioxidant substances that help the recovery of the body in general. I've been taking it for a few weeks and I must say that my skin is already brighter. But I will be able to give a more complete judgment over a longer period of time. I bought two boxes and we will see the long-term results. Some of the reviews do make me laugh a little. These little sachets claim to contain a series of supplements that will aid in creating a glowing complexion, it certainly doesn’t state you’ll get it after taking one or even five doses. As vitamin drinks go, they’re tasty. A fresh orange taste. Regarding the comments that it doesn’t dissolve, I popped the sachets into my drinks bottle and simply shook it. Dissolved easily. I’m on day 12 of taking these currently. The visible effects perhaps aren’t clear to see just yet (but I wouldn’t expect them to be) but I haven’t had any breakouts at all, something that other brands like Berroca causes with my skin. My main downside here is the price. The 30 sachet box is just too expensive and then five sachet box seems useless, surely it should be a seven sachet box? That I can’t quite understand. This staff tastes amazing to replace the morning orange juice! There's no denying that Goop the brand divides a room, it's either 'I love' or "I hate'. 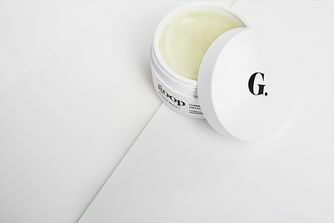 I sit firmly on the Team G side of the fence, judge me as you will :) GOOPGLOW on the other hand is a product that everyone loves because it's really, really good. It tastes delicious, it dissolves quickly without faff and gives me a lovely morning boost that is good enough to replace my second cup of coffee now (the only thing I could conceive being good enough to replace the first is Ryan Gosling...). Where was I, ah yes...Then after a week of using this comes, The Glow, I call it 'Billionaire Face' because it's what you see on the heavier of wallet. A clear blooming glow like someone switched on a light in the middle of your head. And that, my friends is my Beauty Nirvana!